I know that I always tell you about favorite recipes. BUT. This is REALLY a favorite recipe. Guess what we are putting in our fajita marinade? BEER. Lime juice. All of the flavors. I don’t hate it! If you follow me on snapchat (which if you do, I’m sorry), then you know that we make these freaking fajitas like twice a week. At least once a week, then eat the leftovers for two or three days. And do different things with them! Oh. But also, sometimes we make these on Monday with steak. Then again on Wednesday with chicken. Maybe on Friday with shrimp? And then just eat fajitas the entire week, alternating the meats. Alternating the dishes. Are we the most boring souls on the planet? Probably. It all started when I wanted to find a quick dinner solution shortly after Max was born. I wanted something fresh but didn’t necessarily have the time to put it together. Soooooooo. I found the recipe for Ree’s fajitas and threw together the ingredients one afternoon to marinate and Eddie grilled everything once he got home. Oh my gosh. This was/is the easiest and best idea ever. And in all these months, we haven’t tired of the fajitas at all. In fact, we love them so much that we’ve foregone (?) our usual ground beef or turkey tacos because after these? They’re just…meh. For dinner, we almost always serve the beef with tons of crumbly queso fresco on hot, charred corn tortillas. Half the time we end up standing over the counter and eating one after another because they are just.that.good. I throw a bunch of cheese on tortilla cheese, melt it a bit under the broiler, then follow with steak, peppers and more cheese. One more round of heat until bubbly, then extra cilantro, salsa and queso fresco on top. UGH. It’s so fantastic. I want it in my face right now. If I’m feeling really awesome and want to make excellent life decisions, I’ll throw everything on top of some spring greens. It’s actually my favorite way to eat greens and salad at the moment. I’ll add an avocado (sometimes I feel like it gets lost in the tortillas or chips, do you feel me? ), lots of salt and pepper and just use the salsa as dressing as well as the juice from the peppers and steak. It’s heaven, I tell you. Heav.En. Yep, stupidly simple but packed with loads of flavor and an awesome option for a busy week. Makes me feel like I have my stuff together. And I so don’t. So that has to mean something? corn tortillas or spring greens or tortilla chips! Place the flank steak in a baking dish or resealable bag. Place the peppers and onions in another dish or bag. In a large bowl, whisk together the beer, oil, lime juice, sugar, worcestershire sauce, lime juice cumin, both chili powders, smoked paprika, salt, pepper and garlic cloves. Pour half of the mixture over the beef and the other half over the peppers/onions, tossing well to coat. Cover both dishes and refrigerate for a few hours or even overnight. Toss the steak and peppers every so often to coat in the marinade. Heat the grill on the highest setting. Create two foil packets – I like to use two sheets of foil for each. Divide the peppers and onions between the foil packets, folding the edges of the foil up slightly. Cover the tops with a third piece of foil. Place the pepper packets directly on the grill. Grill for 5 to 10 minutes, tossing once or twice. While the peppers are grilling, place the flank steak directly on the grill. If it’s about 1-inch thick, grill for 5 to 6 minutes per side to still have some pink in the steak. When you remove the steak from the grill, let it rest for 10 minutes. After 10 minutes, slice the steak against the grain in to super thin strips. Serve the steak with the peppers on top – in your fajita vehicle of choice! For the corn tortillas, we char them slightly on the grill or gas stovetop. For the salad, we serve all of the above on a BIG bed of greens. I usually don’t use any extra dressing, there is more than enough juice and flavor and salsa. For the nachos, before piling everything on top, I cover tortilla chips with a cup or so of freshly grated cheese (cheddar, monterey jack, etc). I add the steak and peppers and broil for a few minutes until the cheese melts, then continue with the rest of the toppings. Wow, I better get me some new sunglasses because that’s how hot these taco’s look. I just see myself eating this poolside, on a floatie, thinking about how I’m off for the summer and don’t have to teach gym class right now. Your presentation is just stellar on this one. Have some friends coming over to help me with my drywall problem, I need to make these for them for lunch (okay, maybe my wife if I’m busy). I have all of these ingredients on hand now and I’m pretty sure I NEED these. Like, yesterday. I’m always so impatient, but the look of those charred corn tortillas might be enough to make me wait for them to char! I just see these fajitas in my future. And pretty much ALL three ways too. ;) Seriously, could you EVER go wrong with beer-marinated chicken?? Definitely adding this marinade to our mix because it sounds like perfection! Jessica, these look- dare I say it? Fresh to death! can’t go wrong with beer and lime! I would totally make these every day of the week, too!! These look incredible! The tortillas look so good too! um, you’re my go-to for Mexican inspiration and you’ve just taken things to a whole new level. what is life? is it real? I’m thinking about switching up my life and doing a whole30 (am I insane? probably.) and I think I can TOTALLY make these whole30 compliant… I just need a substitute for the beer… is there EVER a substitute for beer? wahhhh. As a Baptist minister’s wife, I have not consumed much beer :P Suggestion on what to use to marinate? you can use ginger beer or ginger ale! Thanks! I’m open to using beer, I just don’t have a “favorite.” I wouldn’t even begin to know which one to choose. You know it’s an awesome recipe if a blogger makes it multiple times! I love the creamy, tangy, savory deliciousness going on in these tacos! Pinned! 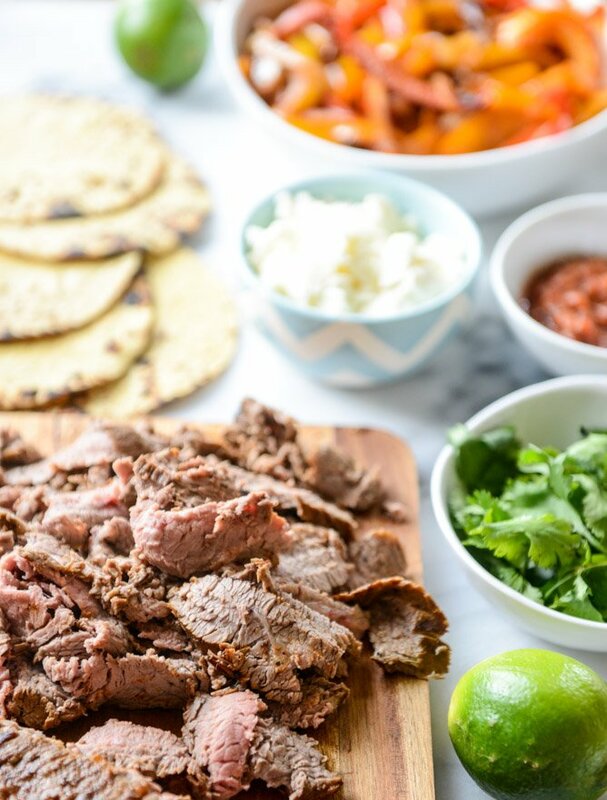 OMG you have no idea, but that’s almost exactly how we do our flank steak tacos, the bell peppers are such an amazing combo, and we load our with lost of feta cheese and avocado! This is a drool worthy, must make recipe! These look delicious! So summery! It look like a greek plate at first,doesn’t it? I’m still not convinced about Mexican food…maybe this time? Oooh! I want to echo Hannah — I don’t have a grill either and I’m dying to make this! Broiler? Stovetop? In the winter when my grill is sadly dormant, we do fajitas on the stove top. I cook the meat until almost as done as I like, take it off and let it rest for a few. Then slice it and add it back to my pan with all my veggies for just a couple more minutes on low. I like my veg almost raw though. I love the word supercalifragilisticexpiaalidocious which my dad always used when he described the fun we were about to have as we drove to Cape Cod for a family vacation! Oh Lawd I’m starving! Gorgeous pictures. Can’t wait for your monthly faves. ¡Fantástica receta! Fácil de preparar y con un resultado delicioso. Gracias por compartirla. These tacos are just what screams summer… DELISH!!!! I really want fajitas now for breakfast. Oh Lawd I’m starving! nice post ! These look amazing! LOVE fajitas so much. I’ve been eyeing these up for the last week or so and I can’t wait to make them! Just one question though, I’m from England and I am pretty certain our definitions of a grill or grilling are completely different ! I don’t suppose you could let me know what you mean by it ? LOVE THESE!!! I have made them on several occasions now, and they are always fantastic. I did modify slightly though. I changed the beer to a special ginger ale called Ale8. I also placed the meat (pork loin), and veggies in separate bags and poured the marinade in and let them refrigerate overnight. Then after placing the veggies in the pan, I poured the remaining marinade into a separate pot and reduced it down. It makes a wonderful, spicy sweet, and somewhat syrupy sauce that goes awesome on the fajitas.